Pixe Social, the Maryland-based start-up and developer of social marketing solutions, announces its partnership with the Consumer Electronics Association (CEA), producers of the International Consumer Electronics Show (CES), to provide the official social photosharing solution at the 2015 Show held in Las Vegas, NV between January 6-9, 2015. CES is the largest face-to-face showcase of emerging innovation in technology, which attracts over 3,000 exhibitors and 150K+ professionals from the consumer electronics industry. While exhibiting at CES 2014, Pixe Social impressed CEA by engaging with thousands of fans both during the show and online through their powerful social marketing solution. At CES, Pixe Social will provide a roaming team which will engage the event participants to share their photos with other CES fans in real-time. Show attendees are invited to visit the CEA Center in the Grand Lobby of Tech East to capture their memorable hi-tech experiences at the event and share them with friends and family via Facebook, Twitter, and Instagram live from the Show floor. Photos will be framed with a special #CES2015 visual theme, and posted instantly to the CES Pixe Social Facebook Page, Twitter, and Instagram with the official event hashtag. In an exciting contest, users are encouraged to tag, like, and share their Official CES 2015 photos online for a chance to win a GoPro Hero 4 from Pixe Social by collecting the most likes on Facebook by Friday, January 23, 2014. Show attendees can also share their own CES 2015 moments from their personal mobile devices by downloading the CES 2015 Pixe app. This custom, branded social photo sharing app is available for free download through Google Play and the App Store so that all show attendees can have the chance to share official Show photos on their own social networking channels. 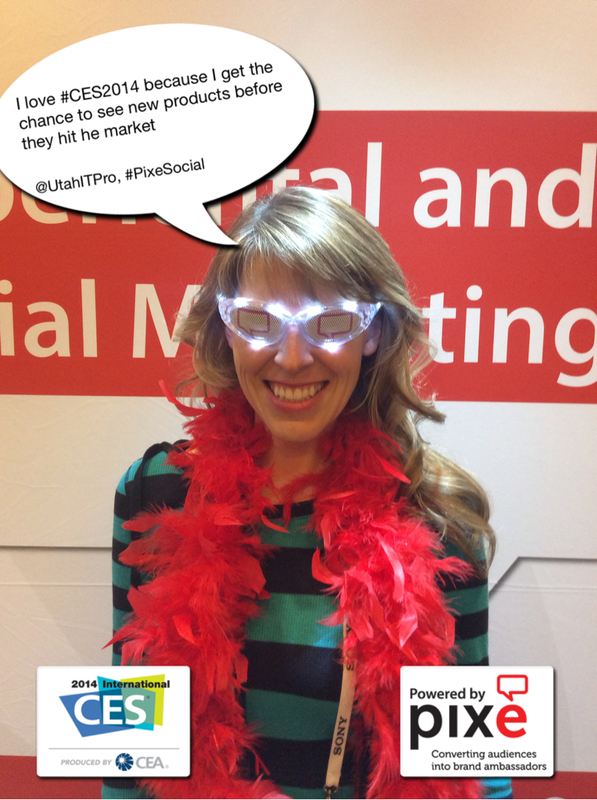 App users can keep the #CES2015 social buzz going by posting their photos directly to their own Twitter with hashtags #CES2015 and #PixeSocial to enter to win a complimentary $200 Amazon gift card provided by Pixe Social. Please visit this page for terms and conditions as well as additional details about the contests. Pixe Social is a Maryland-based start-up providing turnkey social marketing solutions that is on a mission to take the challenge out of social media marketing by converting audiences into brand ambassadors. Pixe Social’s solutions have the unique ability to extend a brand’s online community and boost social presence in a matter of days.